Who are terrible house guests but terrific neighbors? That would be bats! Whether you see them as cute or scary, bats are an essential part of the Florida ecosystem. Contrary to popular belief, they do not attack people, and there are no vampire bats indigenous to the United States. If you see a few dozen bats enter or leave any part of your house or business, there are likely hundreds living in a colony there. If you see hundreds, there could be tens of thousands. There are some 18 species of bat considered to be permanent Florida residents. All but one of these species are Microchiroptera (micro bats). The remaining species is a fruit bat, currently only found in Key West. Typically, bats only need a very small gap through which to squeeze themselves into the structure of a building (as little as half an inch). Ironically, a large opening is less likely to attract them since their predators (eagles, hawks, snakes, and owls) can also enter such areas. Bats are nocturnal and are generally very shy and docile. They can live for 30–35 years and are extremely beneficial to the environment. Each animal can consume its own body weight in small flying insects (as many as 2–3,000, including mosquitos) in a single evening. Some species of bat are endangered, and even those that are not endangered are protected by the laws of the state of Florida. However, because they can roost in very large colonies (sometimes numbering in the tens of thousands), this can cause serious problems for people, and so we are allowed to conduct a humane exclusion. • Fungal—Histoplasmosis (from the Histoplasma Capsulatum fungus) is a fungus spore that grows on the droppings of both bats and birds. Its effects can range from a simple bout of flu-like symptoms to a much more dangerous chronic respiratory condition. • Viral—Rabies can be contracted as a result of contact between infected saliva or nervous tissues and the mucous membranes found in the eyes, nose, and mouth. It can also enter the body through open wounds. However, it is almost always transmitted by a bite from the infected animal. Although a minute number of cases of airborne infection have been reported as having occurred in cave environments, none have been recorded as having occurred in man-made structures. Only a very small percentage of the bat population are thought to carry the disease. 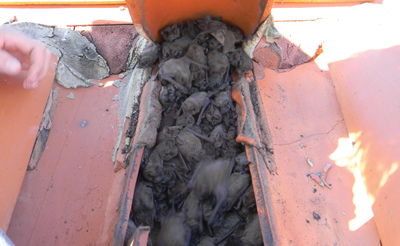 Although there are health concerns relating to bat infestations, the primary cause for requesting an exclusion is because of staining on buildings, the build-up of significant guano deposits (droppings), and the odor emanating from such deposits, as well as from the urine and the bats themselves. Unlike rodents, bats do not chew through the fabric of the buildings. However, the urea in their waste products is very corrosive and can of itself do damage over time. Bats have a gland that secretes oil to condition their fur. When entering a building, they will often rub against it, leaving a stain. 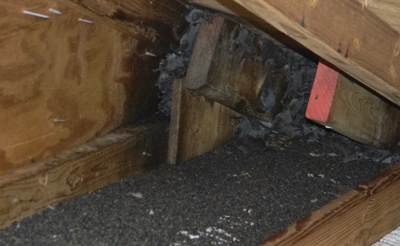 Left unattended, the structural integrity of ceilings, walls, and roofs can be compromised. Because of their protected status, once the female bats are ready to give birth—they give birth just once a year—the Florida Fish and Wildlife Commission institutes a moratorium on disturbing them during this time. This is because bats are mammals. They give birth to live “pups”, and the mothers breast-feed their babies. Very young bats are unable to fly, so if an exclusion takes place when they are present, the mothers would be unable to return to the pups; the pups, in turn, would perish since they cannot fly from the roost. This “Bat Maternity Season” extends from April 16 until August 15. Because bats are so long-lived and extremely territorial in nature, they will always try to return to their primary roost. However, if this is denied to them as a result of an exclusion, they will typically simply infest the nearest suitable building. In order to prevent this scenario and in the case of customers with multiple on-site buildings, Friends of Bats will usually be asked to bat-proof currently uninfested buildings prior to the actual exclusion. Since they are not disturbing any colonies in these uninfested buildings, this type of work can proceed during the maternity season. Once the season is over, they will re-commence exclusion work from infested buildings. State law requires bats to not be interfered with in any way during maternity season. If you do discover an infestation during this period, it’s a perfect time for all your neighbors to seal up their access points. Once maternity season is over and your bats have been properly removed and safeguarded against their return, your neighbors’ property will be their next preferred colony location. In Florida, all species of bats are protected from being harmed. This is primarily because of their great importance to the balance of our ecosystem and their unmatched contribution to managing the mosquito population. This legislation applies year round. However, because bats can also pose some potentially serious health risks to people when they take up residence in buildings, expert companies, such as Friends Of Bats, are permitted to perform humane exclusions during much of the year. The methodologies employed ensure that the animals leave the premises safely and that they can’t return. Dan Bozone is President of Friends of Bats. He says, “All of our work is guaranteed, insured, and accredited. 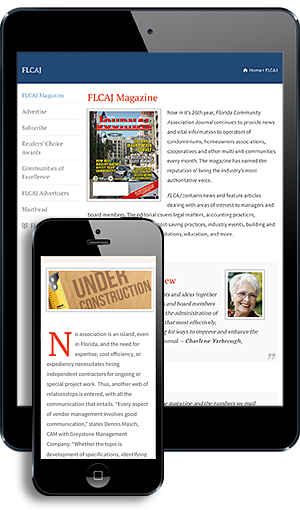 I’m not going to claim to be America’s best, but I know that no one is better.” Friends of Bats is exclusively focused on delivering safe and humane solutions to bat issues throughout the entire state of Florida. Bat removal, prevention, and education is their only business. Over the past ten years, this family-owned and operated business has provided exclusion services to more than 2,000 satisfied customers. Call them at (888) 758-2287 or visit their website at www.FriendsofBats.com.